Tonight on ABC World News, the reporter did the usual when gas prices rise; go to a gas station with high prices for the area and interview drivers who are spending big bucks to fill their tanks. No mention whatsoever of the speculators who are presently responsible for rapidly rising prices. No mention either of declining demand for gas to the extent that gas is being exported because the US supplies are greater than demand. When oh when will the corporate media give us the information we need to demand better from our government regulators and our lawmakers. I advocate that we break apart the oil companies as Teddy Roosevelt did with Standard Oil 101 years ago. That would be my long term solution. In the short term, I would ban the export of refined gasoline, and I would regulate or tax or both speculation in petroleum. 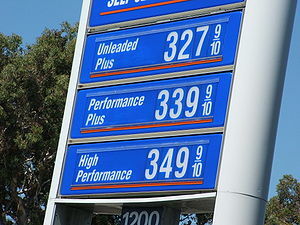 And here I was starting to think the public was becoming aware of the speculators’ role in driving up the gas prices. Maybe the bloggin community needs to band together and do a full day or two posting about this. We could expand it onto social media, tweeting about it and putting it out on Facebook. We might get some attention. Excellent idea. I hope that Barack mentions it in today’s speech. I am so flipping outraged at gas prices. They usually at least WAIT until Memorial Day comes to jack them up for all the traveling. But now they are jacking em up in February? What do you say… you think they’ll reach $6/gal by June? Depends on if Israel attacks Iran. Could go a lot higher, please refer to my posts on the Strait of Hormuz. If they do reach $6./gal by June I expect people to riot and “Occupy Wallstreet” to hit the streets harder than last year.